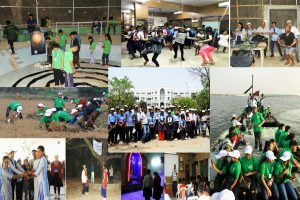 Save Our Planet is a movement initiated by Nepal Jesuit Social Institute where young enthusiast from different schools are encouraged to take action to maintain healthy environment. A group of executive board members which is commonly known as Eco-club, are formed in each schools and then they conduct eco-friendly program such as Cleanliness campaign, Plantation of trees, Recycling/reuse, Fund raising, Media, and Documentation respectively. To guide them with more ideas on cultural values and activities related to conservation of environment outside the country, NJSI planned for an exposure program to Tarumitra. 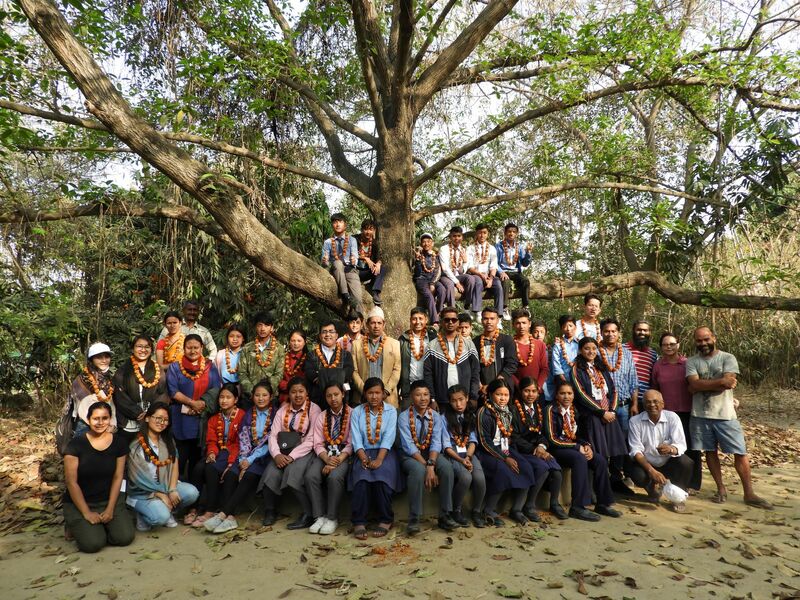 Tarumitra which means Friends of Trees is a nationwide student organization in Patna, India. It has been promoting ecological sensitivity and campaigning about various ecological issues since 1988. It was started as a movement to protect and promote a healthy environment and now it has spread to over 1000 schools and colleges having more than 2,00,000 members. Tarumitra has also set up a bio-reserve in Patna where it has a rare collection of over 400 vanishing trees and plants. On 31st March, 2019 altogether 25 students and 7 teachers from 7 different schools gathered in NJSI premises to start their journey for International Exposure Program. After their arrival, a short introduction to Tarumitra and the concept of this exposure program was discussed. At around 6 in the evening, everyone jumped in the bus all with excitement and departed for Patna. After a long tiring journey, they reached Tarumitra Ashram at 4 pm on 1st of April. Tarumitra graciously welcomed every member of SOP (Save Our Planet) team. They were then oriented about Tarumitra movement and its success till now which was followed by Ashram tour. The next day started with harvesting chickpeas early in the morning. Later everyone had a campus tour which was then followed by session on Big Bang Theory, Organic farming and making seed bombs. Cultural program and Eco-meal marked the end of the day. Next day was for harvesting green leaves. Later they had an interaction session with nearby school, Don Bosco Academy where they shared about their problems and exchanged ideas on solving them. After interaction, it was the time to practically know about Big Bang Theory in a Cosmic Walk session in which they got to know details about the history of earth. 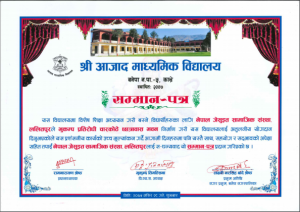 Students were awarded with certificates for participation. On the last day, on 4th April they were taken for a city tour where they had a boat ride in the Ganga River and got to know about its history. After that they had a visit to Carmen High School and also Women’s College. The day was then followed by visit to Planetarium and International Museum. They were also taken to Patna’s market and for a short Zumba session which they really enjoyed. After a long day, the team was taken to Queen of Apostles’ Church and a graveyard which was beside the church. At last they had an interaction session where everyone spoke about their experiences and promised that they will take initiative for the environment conversation. They left for Nepal at 11 pm from Tarumitra. The participants are really thankful to NJSI and Tarumitra for the golden opportunity. The experience for them has been different and has made them aware about the practices in the setting of India. They are grateful as the event has made them more responsible and self- confident. Every individual in the event has grown in one way or the other. They have promised to take steps and spread the knowledge on environment. 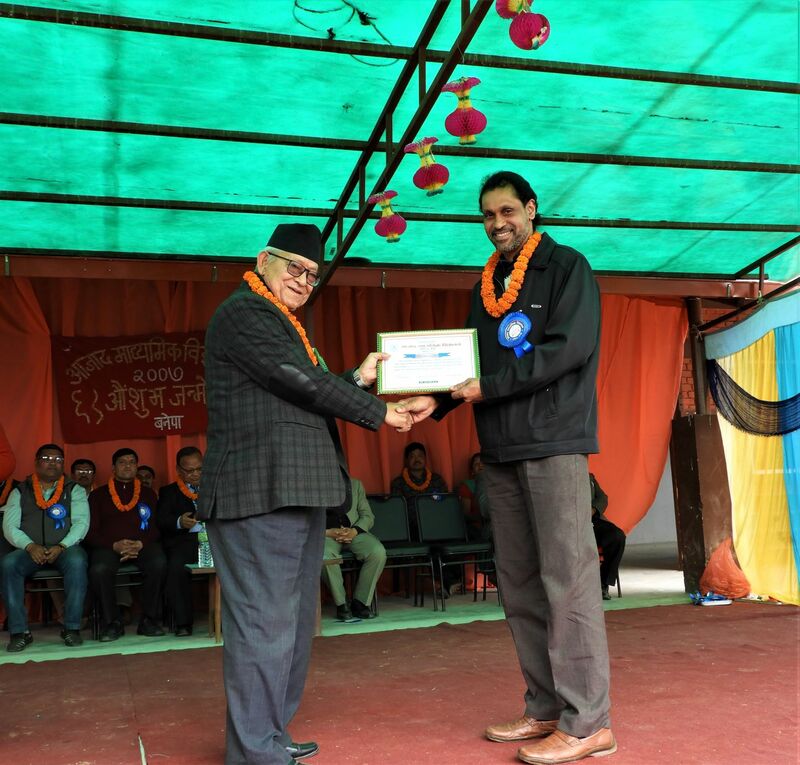 With the history of more than 10 years, Azad Secondary School is counted as one of the renowned schools of Banepa. In the recent years, Nepal Jesuit Social Institute has developed a special bond with the school. From educational intervention like Personal Development Camp and formation of Eco-club to building hostel for children with special needs, continuous support is being provided to the school. The school was recently provided with 100 sets of desk and benches. On 9th of March, the school management committee invited NJSI as a special guest for their annual day program. 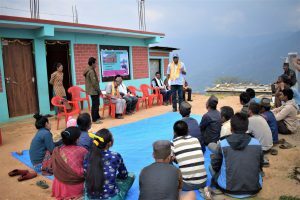 In the event all students and teachers of school, as well as special children from the hostel, members from school management committee and Laxmi Narsinga Bade Shrestha, Mayor of Banepa showed their presence. The program started at 12 in the afternoon. Student performed dances which was later followed by speech from honored guests. The Mayor and the school provided NJSI with appreciation certificate for continuously supporting school development in every way possible. On this special occasion, the school management committee expressed their heartfelt gratitude toward NJSI and wished for stronger relationship in the years to come. NJSI has been providing guidance and platform to convert their potential to meaningful impact and also wishes for better future. There is no other wisest investment than an investment in health. Realizing the need of a medical camp to address health issues of people of Koshidekha and Jaretar, NJSI collaborated with Navjyoti Center to conduct medical camp in each place. Along with NJSI and Navajyoti team, a team of therapist from Hong Kong of 8 also joined the health camp and conducted checkup and seminar on Reflexology. 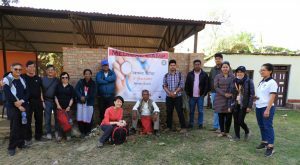 On 5th of March, Health camp was conducted at Koshidekha, Kavre and on 10th Reflexology seminar was conducted at the same place. On the next day, students and teachers of Bhagwati School, Kharelthok, Kavre received information and free checkup by reflexologist. 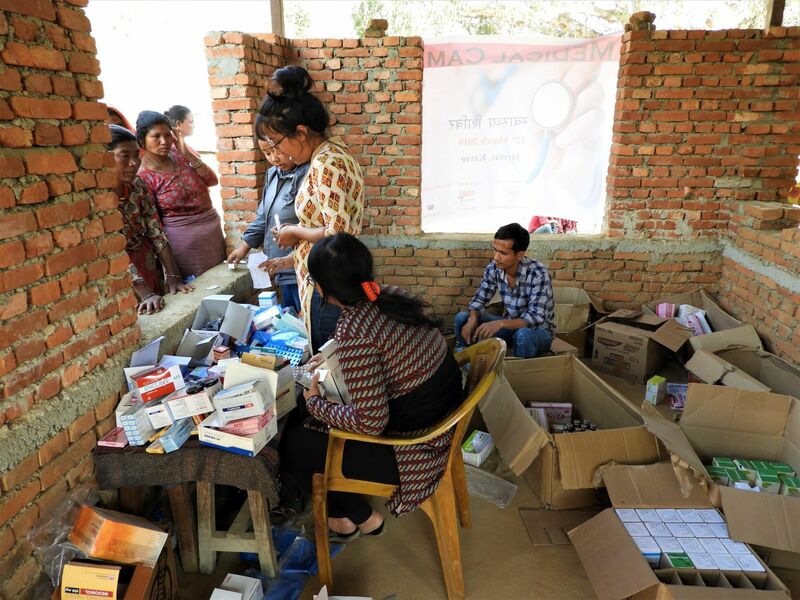 On 12th March, all three teams gathered and conducted health camp where general checkup, distribution of medicines and seminar was done. The first camp benefitted 423 people, 60 joined in the seminar on the second day. 58 participants attended the seminar in Bhagwati School and a total 356 people got successfully examined in the medical camp at Jaretar. The medical camps treated people who had mostly invited problems in their body as a result of excessive narcotic and alcohol addiction. Most of the patients also complained about irritation in their eyes as well as their skin, which might be the result of their lifestyle and the weather. Elderly people had a relatively high ratio in both the camps who complained about the inevitable problems of ageing. The beneficiaries were extremely happy to receive medical support and checkup. They were thankful to the reflexologists who gave them information on symptoms of some diseases as well as the cure or methods of minimization and the doctors who prescribed medicines for other. 8th of March, International Women’s Day is an annual celebration all over the world to celebrate and acknowledge womanhood and their contribution in the society. Throughout these years, the world has witnessed a significant change and attitudinal shift in both women’s and society’s thoughts about women’s equality and emancipation. 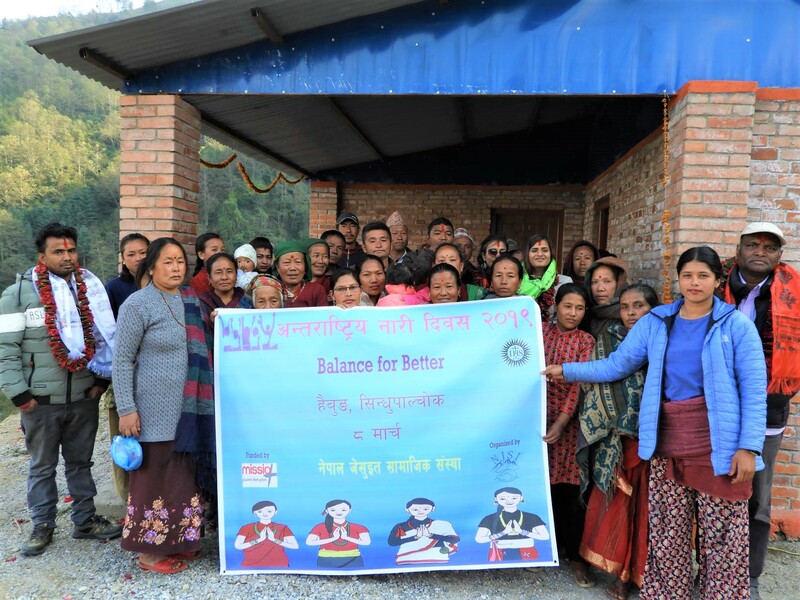 Sticking to the motion “Balance for Better”, theme of this International Women’s Day 2019, gender mainstreaming in socioeconomic reformation has been a crucial focus of Nepal Jesuit Social Institute. To celebrate Women’s Day, we went to two different places; Haibung, Sindhupalchowk and Tinkanya, Sindhuli. Along with NJSI team, visually impaired representatives from Bright Star Society and Blind Rocks also joined in the celebration. 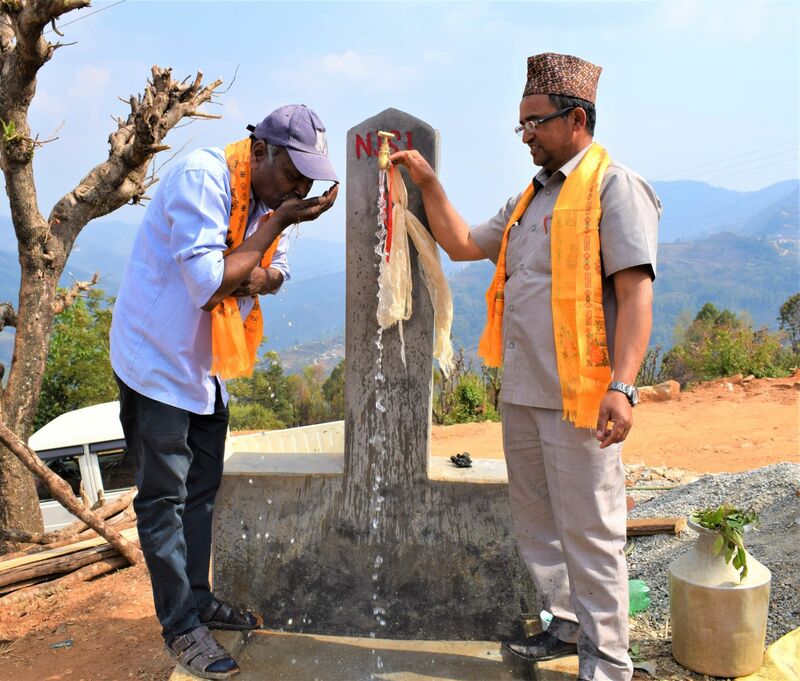 34 people in Haibung and 39 people in Sindhuli gathered together for the program. The program started with welcome speech by locals. 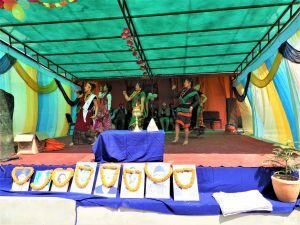 It was then followed by interactive games which made them open up and participate with full enthusiasm. Representatives from both of the organization gave motivational speeches on how they managed to rise despite of their inability to see. 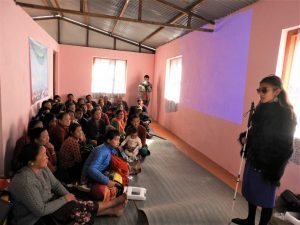 Video presentation and quiz were the main activities where they got to learn many facts about women and empowerment. The program was filled with poem, songs, dances and happy faces while returning home with determination to step up for equality. Both of the places had engaging and enthusiastic participation. NJSI will continue to dismantle such stigmas by creating opportunities for women to utilize and outshine their potential, and prove themselves. Women of Nepal are always backward when it comes to participate in their emancipation and the reasons are illiteracy and low economic status. They are always dependent, thus have less role in decision making in the family. 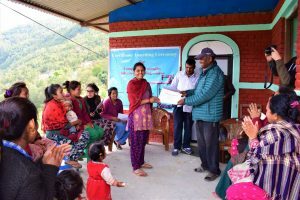 Nepal Jesuit Social Institute is helping the women to raise their status and enhance quality of life, skills and knowledge by providing vocational trainings like tailoring. 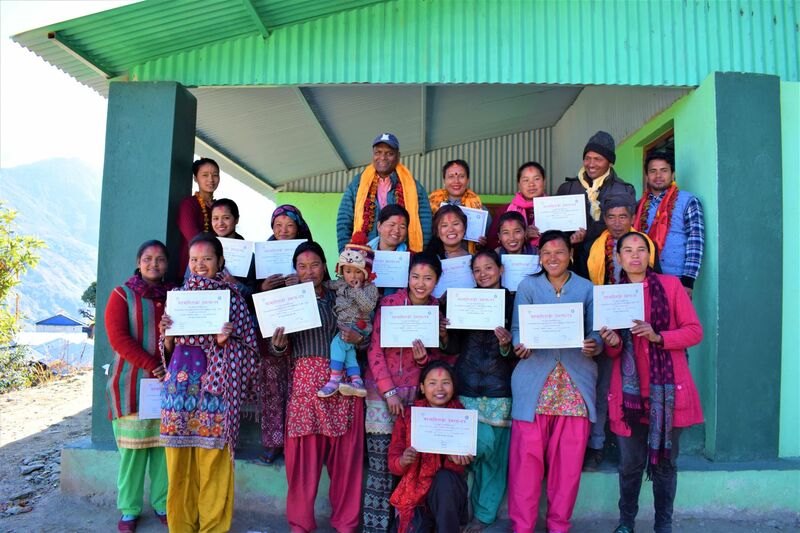 On 25th February 2019, NJSI team went to Suri, Dolakha for the completion program of Tailoring Training. 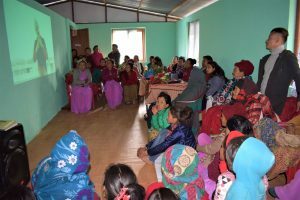 This 3 months course was provided in 2 different places in which one place is inhabited by Tamang community and other is Surel community. 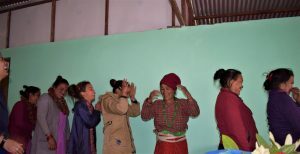 Basic Tailoring course was followed by Tamang community whereas Advance course was for Surel community to 14 people each. Both communities acquired knowledge on stitching garments. They were thankful to NJSI for the opportunity provided and helping them to come out of their comfort zone to become self- sufficient. They ensured that they will teach these learnt skills to other women who choose to be self-employed and independent. With the help of this vocational training, they learnt and developed skills to earn money to live life with dignity.